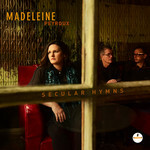 Twenty years after her recording debut, Dreamland, Madeleine Peyroux continues her musical journey of exploration beyond the ordinary with Secular Hymns, a spirited and soulful masterwork. Recorded with her touring band-mates of the last two years -electric guitarist Jon Herington and upright bassist Barak Mori- the trio crafted the album in a live setting in a small church in the Oxfordshire countryside of England. The result is a stirring collection of songs that have their own hymn-like stories of self-awareness. "Music has been our spiritual life," says Peyroux, "so I think of these as hymns, secular hymns-songs that are very individual, personal, introverted." With her seductively expressive voice, Secular Hymns sees Peyroux interpreting tunes by seminal blues artists Willie Dixon and Lil Green, classic gospel singer Sister Rosetta Tharpe, dub reggae innovator Linton Kwesi Johnson, contemporary craftsmen Tom Waits, Townes Van Zandt, Allen Toussaint, 19th century American giant Stephen Foster, and an early African-American spiritual. The evolution of Secular Hymns is as organic as the recording itself. The story starts with a concert in the aforementioned church in the rural Oxfordshire countryside. Celebrated French chef Raymond Blanc had purchased an old manor in the tiny village of Little Milton and renamed it Belmond Le Manoir where he hosts events, including a nine-course meal in his Michelin-starred restaurant. As a part of the whole experience, people are invited before dinner to go to the nearby 12th-century Norman-styled church, St. Mary the Virgin, to attend a concert of live music. Last year Peyroux and her trio were invited to perform. "At the sound check, I was singing Randy Newman's song 'Guilty,' and it was amazing the way my voice sounded in the cavernous room," explains Peyroux. She continues, "It has a wood ceiling that gave my voice a reverb. My live engineer Doug Dawson told me I should make a record there." Fresh from the rarefied experience of performing their songbook there, they returned to the church a few months later with the intention to document the work Peyroux and her band had been developing on the road. "We had become very close, and had been stretched to come up with new sounds," the acoustic guitarist says, noting that she had added a guilele (a cross between ukulele and guitar) to the voice of the band. "Jon was always so versatile on the guitar and Barak is very good with a bow. Plus they both like to sing. " Peyroux booked the 200-seat church for three days-first day for set up and sound check, second for a free live show for townspeople that was recorded, and third to recut new live takes sans audience if needed. "It is a blast playing with Jon and Barak and so much has to do with the interplay among us," says Peyroux. "It's a recording that reflects the organic way we have been working as a trio on the arrangements of these songs." While noting that she veers away from being "the normal jazz trio," Peyroux nonetheless brings her jazz sensibility into roots music territory in such a moving way that she captures the celebration and praise implied in the songs-a special ten-song collection of bona fide Secular Hymns.